Kampala, March 5, 2017 (SSNA) – In an exclusive interview on Sunday, a former Ugandan intelligence agent told the South Sudan News Agency (SSNA) that Egyptian government is actively pursuing a sneaky military strategy against Ethiopia’s Grand Ethiopian Renaissance Dam (GERD) and that Egypt is also assisting South Sudanese government in its war against the Sudan People’s Liberation Movement/Army-In Opposition (SPLM/A-IO). James Moises, the former intelligence operative alleges that Egypt and Uganda mutually agreed last year to achieve what he described as “two different interests. Moises went into details, explaining why Uganda and Egypt joined forces against Ethiopia and South Sudan’s armed opposition. “This is a sneaky strategy against the Ethiopian government,” he asserted. Moises revealed to the SSNA during the interview that Ugandan President first proposed to the Egyptian President Abdel Fattah el-Sisi in December 2016 that if Cairo agrees to give Juba weapons and ammunition it wants to defeat the SPLM/A-IO, then Uganda would support any campaign Egypt wants against Addis Ababa. He further disclosed that Museveni even promised el-Sisi that he has what it takes to bring on board other East African countries to back-up Cairo. This is not the first time James Moises make claims like these. In July 2013, about four months before South Sudan civil war broke out; he wrote an article exposing Ugandan President Yoweri Museveni meddling in South Sudan internal affairs. His piece caused panic in the entire East African region and around the world and widely credited for exposing Uganda’s troops presence in South Sudan before the war erupted. Moises also warned in November 2015 that the August 2015 peace deal would not succeed, saying South Sudanese president Salva Kiir and his Ugandan counterpart Museveni had already drawn up a plan to prevent the implementation of the agreement. He then disclosed that Kiir and Museveni’s scheme to frustrate peace implementation would include first agreeing to IGAD and the international community brokered demands, allow rebels to come to Juba, and then start a war in the capital. Last month, the rebel military command accused Egyptian air force of carrying out air attacks on its positions in Kaka town in Upper Nile. Cairo denied the allegations. South Sudanese rebels also alleged in January that Egypt and South Sudan had strike a dirty deal, alleging the pact between the two countries includes a secret sabotage campaign against Ethiopia’s GERD. This should not be a surprise. Politics is all about interests. Egypt stands for Egypt so is Uganda but what about us? Kiir is working for Uganda and now Egypt. What are we doing to instill nationalism in South Sudan against the onslaught of tribalism orchestrated by Kiir? We need to get rid not only Kiir but his system in order new national institutions can be implanted in the country. At first SPLM/IO seemed to lead the way but now it seems they have become silent. Equatoria, Bahr el Ghazal need defensive weapons. Weapons must come by all means for defense. Otherwise it is not wise to fight a war that a defeat is eminent. Kiir can be got rid of by means that brought him up. If SPLM/IO fails its responsibility then a people’s resistance that is capable of bringing justice, peace and independence must grow up to fill the near political vacuum we are now experiencing. We need to get stinger missiles to get rid of those helicopter gunships and leave every thing on the ground. Any force, evilagreemes and backbite strategy shall not stop Ethiopia from going forward or its developments. Cairo will see its shame if goes hiddenly with Campala.No one can stop us from building our Dam. The war in SS proved to be too hard for both Egypt and Uganda, hence their objective is hard to come by. I think they need to restrategize coz war in SS is intensifying at a faster rate each day, despite abetting Kiir with ammunition medical kits. al-Sisi and Museveni are committing atrocities in a foreign country, UN must hold them accountable and stop them forthwith. Kiir will never achieve peace in SS whether politically or militarily coz of his fragile and disillusioned memory tainted with war, he statue is tantamount to guerrilla warmonger not a statesmen. This is demonstrated by recent unveiled national dialogue where he declared himself patron. How can you be patron of peace when you continue to butcher the pple ? even the composition of his peace commission demonstrates his inability to lead the war torn country. the opposition was isolated, therefore how can he bring peace with his friends? As a result of his arrogance he can try it but the results will be catastrophic. He proved that he is not well trained leader. He does not know politics. It is enough that he went far to middle east to find someone evil and sneaky to support him. In many ways there is no any point that bind them together. They have no shared border, they are Muslim and Christian, they are Arab and African. The most racist country are Egypt. The most liers, thief and vandal in the world are Egypt. Kirr doesn’t know any part of them and yet he wants partnership. People of south Sudan want total peace God will punish whoever is working for the destruction of south Sudan. Shame on all the countries that has interest in south Sudan. It is important for Sub-Saharan countries to understand that Egypt has never been interested in us. They especially don’t care for black Africans. Historically, they have been puppets of the British and now the Saudis. 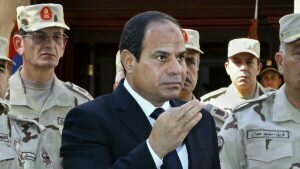 Sisi wanted to give the Saudis an island in the Red Sea. Egypt cannot even control rebels in the Sinai who are killing Egyptian soldiers like flies. The Egyptian economy is sinking, the government is corrupt. I wish Egypt realizes that Ethiopia has always been a peaceful nation unless provoked. The Koran states that Ethiopia should be respected as she protected the Prophet Mohammed. Egypt is being an infidel herself. As for drunk Museveni mind your own country. Don’t forget Shabab came to your house. People of south Sudan want total people of s sudan want peace God will punish whoever is working for the destruction of south Sudan. Shame on all the countries that has interest in south Sudan. Kampaa and Cairo are exploiting the weak leadeship of Kiir exersperated by an Ethnic agenda. The to governments are avtuslly aiding a babaric bunch of trigger happy warlords to destroy the SouthvSudanese peple. Kiir and Malong shiuld remember the role Ethiopia plaid in the 23 year liberation war that brought them to power. Salva Kiir is just not the kind of leader that South Sudan needs. Man,you talking about that Eprd or Eplf would have war against the Sudan government at time when Dearg time.they have their own enemy to face than Ethiopia. Pleas let’s not disrespect to neighbouring S.sudan like they are no they know what is war.so pleas Ethiopia ‘ye sine libona meregagat yasfeligal ‘.belive that we are coming out of poverty…..period.we got muscle..
we know all what they do Egypt our historical enemy and Uganda . The alliance between Egypt, South Sudan and Uganda can be described as unholy and blindfolded. Ethiopia as a neighboring country contributed and still continued contributing for peace and stabilization of this youngest country including receiving a highest number of refugees. Besides these two countries have a greater tendency to have economic, social and political strategic partnership. Where as SS partnership with with Egypt and Uganda is temporarily as far as the kir regime is on the throne. These two countries have no common interest, their strategy is unworkable due to the factors mentioned above. For Ethiopia ‘ keep calm and strive to appear economy gaint in the region’. Egypt is Egypt – a country which has the agenda always to cheat , destabilize and suppress our fellow Africans now nearly for a century . It is hard to believe Museveini , a senior statesman of East Africa to conspire against Ethiopia – a country which is always in the heart of whole Afrca . If is really to this dirty game then history will curse him for ever as a traitor , far worse than the colonialists and neo colonialists. But it requires brave hear , courages ! ‘They’ know it by their BOOK ! Don’t try to make this look like Muslim vs Christians. Because it’s not. Ethiopia is not a Christian country and Egypt is not a Muslim country either. This is a politics of interest. As to the “book ” you mentioned it’s not egyptian “book ” and they don’t know anything about it because if they do they wouldn’t see Ethiopia as enemy. Ethiopia stood with the Islam when they needed the most. I am proud Ethiopian Muslim who loves other Christian fellow citizens Ethiopia as well as the rest of Africa. Peace will be achieved by initiating inclusive approaches to all parties and other stakeholders who the main partner to peace that was inked in Addis Ababa two years ago. Ceasefire and cessattion of hostilities should be observed by the warring parties. Regional leaders who have different interests and unthinkable weird agendas should be kept away and not to interfere with the affairs of South Sudan. Museveini can dance with anyone who pays him till the music changes to Rock and Roll, he can not resist the Ethiopian move. parties going to destroying this basic principle ? Janbo dont mention Somalia in this article thought you know who we are when it comes war and you still remember that for surely, so talk about how you will face the Egyptian not US. we can put nuclear wastes to Nile, every country is happy to give us nuclear wastes, do you know we have been at war with Egypt 4 times in last centuries and we destroy your army 4 times, and also all of Ethiopian people have a solder heart by nature we happy to fight for our country any time. but guys we don’t want go war with Egypt, it will be better if we both win without war isn’t it…? very funny , bragging is not good brother.Why Ethiopia till of today could not release its killed soldiers during Ethio-Eritrean war then ask ur self . Eritrea is minding its own business man has no part with GERD and your enemies. Yes, Ethiopia is capable of fighting wars against its neighbors with the help of its surrogates the west. But what will happen if the west stop breast feeding the Ethiopian regime? Already Ethiopians have started to die of hunger. In fact south Sudanese people to kick out kiir; the only way is peace and love your tribes men and have political campaign that will shows the weakness of Kiir government with right leader not hungry power one eye Rebel leader could not leader south S.completely. Then let us enjoy fighting only that those who are beating drum of war are not residing in the country to test bitter of war but your parents, homestead would smell it, and those who will accept this fragrance situation you develop. May God Blessed Ethiopia, Somalia, Kenya, Djibouti Sudan S. Sudan, Uganda and Egypt in the name of Jesus Christ! We Ethiopian always we pray for a neighboring country. we are not worry God is in control! The enemy of my enemy is my friend. I see no dirty politics here. This is a normal way of gov and army generals work. almost every one knows which is what and they are working on it to their interset. Ethiopia knows what are the consiquences after building Grand R dam and supporting Machar. Uganda stands by Kirr and did their best to chase and crush mechar becomes an enemy to EPRDF. Egypt is always against any plan might ruduce water supply to nile river which ethiopia did it to its interest. Crystal clear politics, no dirty no sneaky. This is news from Addis Ababa organized by the T*****ist regime in Ethiopia. Do you think Ethiopians don’t know this when they start digging for GERD? They have been ready for nearly 100 years since they came up with the idea of using their own water, but failed many times to start. They know Egypt very well and fought with them too directly and indirectly. They knew Egypt’s sneaky idea will come up anytime and will continue to come…its in their blood. It is also written in the bible. This is all about it news here.But Ethiopia is one of the creators of current South Sudan has already decided to stay away from South Sudanese never-end madness. Egypt having good relationship with Uganda (South Sudan or any other country in the world) on other hand, has nothing to do being against Ethiopia. If anything, it has do with White Nile. Regarding to Ethiopian Grand Dam, construction is ongoing as scheduled with both Ethiopia, Egypt, and Sudan already working out their differences on the table (peacefully). Uganda never been and has no reason to an enemy country to Ethiopia. @Bakalu.. frist why don’t you go to school to learn how to write and spelling mistakes. Secondly you’re not mature enough to be able to get a perfect example of Africa, you and some others like your fruits the so called are self haters. Its not about politics its about national interest. So think outside your narrow box my brother. Crazy , Idea . No war mongering. You have to look all riparian countries equal. Work for fair and equitable distribution without war. I would always thinking the white skinned Arab like Egypt, Lybia ,Moroco ,Tunnisia and Algeria will be evacuated the land of Africa ’cause as they were sneak in to getting the land and sneak out of the African territories. We don’t need white skinned has own our holy land . Africa is belonged to black skinned people to have all the power and love. We will need only white paint . But why is Ethiopia interested in white elephant projects. The project is 56 % complete and currently the regime in Ethiopia is collecting money from Ethiopians in Diaspora and there is no good progress. The project is an ambitious project used only for political consumption to support the fabricated reports that Ethiopia has achieved a double digit economic growth in the last year. How can people of a country with a fast growing economy suffer from starvation and die of hunger. Ethiopia does not want war, unless forced. I personally don’t believe Egypt wants war with Ethiopia too. If unfortunately they do, you all know what happens, check history, Ethiopians know how to fight and win. ቀረርቶህን ተውና፡ መንገድህን አዘጋጅ። make urself ready ma neighbour u all gone soon. UNTIL THE PHILOSOPHY WHICH HOLDS ONE RACE SUPERIOR AND ANOTHER INFERIOR IS FINALLY AND PERMANENTLY DISCREDITED AND ABANDONED,THERE WILL BE WAR.NO PEACE AND RUMORS OF WAR.UNTIL THE COLOR OF A MAN SKIN IS OF NO MORE SIGNIFICANCE THAN THE COLOUR OF HIS EYES,THERE WILL BE WAR.NO PEACE.UNTIL THEIR BASIC HUMAN RIGHTS ARE GUARANTEED TO ALL WITHOUT REGUARD TO RACE ETHNIC ,THERE WILL BE WAR.NO PEACE. AND UNTIL THAT DAY THE DREAM OF LASTING PEACE,WORD CITIZENSHIP,THE RULE OF INTERNATIONAL MORALITY,WILL REMAIN IN BUT A FLEETING ILLUSION,TO BE PURSUED BUT NEVER ATTAINED.THERE WILL BE WAR.UNTIL BIGOTRY AND PREJUDICE,AND MALICIOUS SELF INTEREST HAS BEEN REPLACED BY TOLERANCE AND GOOD WILL,THERE WILL BE WAR.NO PEACE. WE RASTAMAN IN THE WEST PROCLAIM THAT WE FACED OUR ARMEGEDDON WITHE THE UNTOLD HISTORY OF YOU ALL PEOPLE OF ARAB AND AFRICAN SLAVE MASTER AND SLAVE DRIVER MENTALITY FOR 400 YEARS.ITS A SHAME HOW YOU ALL NOT SATISFIED WITH ETHNIC STRIFE. BLACK MAN DESTINY AND PRIDE IS AFRICA.MARCUS MOSIAH GARVEY SAY UP YE MIGHTY RACE ,YE CAN ACCOMPLISH WHAT YOU WILL.THERE IS WAR TO KEEP WESTERN HEMISPHERE DIASPORA FROM RECLAIMING AFRICA.ALL AFRICAN LEADERS ARE GUILTY TO SELL THEIR OWN PEOPLE IN SLAVERY TO ARABS.NOW ARABS BITING THEM BACKSIDE LIKE KUNISHA FLEAS.JAH LIVE AND THERE IS A NATURAL MISTIC BLOWING THRU THE WIND.YOU ALL NEED GANJA MARIJUANA THERAPHY AND RASTAFARI PEACE PIPE.BOB MARLEY THE RASTA PROPHET MAKE YOU ALL WARMONGERS LOOK LIKE IDIOTS.SEEK PEACE.PEN IS MIGHTIER THAMN GHE SWORD.THE MALE “PEN IS ” TO MULTIPLY AND BREED UP NATIONS TO PRAISE JAHJAH THE ONE TRUE GOD OF ABRAHAM NOAH AND ADAM.ETHIOPIA REACHES OUT HER HANDS TO GOD ONLY. SHE WILL RISE UP IN THE JUDGEMENT AND CONDEMN THEM GOR SHE REPENTED AT SOLOMON WISDOM. JAH RASTAFARI FLASH LIGHTENING AND THUNDER EARTHQUAKE AND FIRE BRIMSTONE AND TSUNAMI.PRINCES SHALL COME OUT OF EGYPT.ETHIOPIA WILL SOON STRETCH FORTH HER HANDS UNTO EGZEABEHIR.ISRAEL KING IS ISRAEL GOD.JAMAICANS FIGHTING WITHOUT BOMBS AND GUNS.MUSIC WORD SOUND AND POWER OF THE HOLY TRINITY.RETRIBUTION WILL COME FROM ZION HIGH. Is Museveni the President whom I always see him as “very subtle and matured leader ” is really doing this or this is a smear campaign. I do not believe this. He has been an a front man advocate in for fair utilization of the Nile Waters. I wish I hear from him a very clear statement on his stand. it is very clear Egypt is not interested at Africans. Miss Egypt…Try us then you will pay the price.God bless GERD,God bless Ethiopia! Egypt politicians, what’s wrong with you? we are living in the 20th century and off course in the dynamic world. Why you remain static and stupid. Belive me this greed and evil mentality will take you to the hell . No body can stop Ethiopia from using its natural resource!!!!! James Moises, the alleged intelligence agent reads like a south sudanese name. Common sense tells me you were better of under the Arab North. Look what you are doing to yourselves. Babu you are right! South Sudan should never have separated from the Arab North. These people were better of under the Arabs. They complained of Arab rule before independence. Indeed commonsense tells us that the Arabs actually protected the South Sudanese tribes against each other. Now there are no Arabs to blame, they blame Uganda, Kenya, Ethiopia, and the whole world for the havoc unfolding out of greed. Let people making comments about this lie about a Ugandan agent wake up and smell the coffee the South Sudan leaders have brewed for their poor people: Hold those leaders accountable; stop allocating blames to other countries! This is good opportunties for ethiopian that shows how much we stand togethe for GERD and our military power. that is why all of them are in Juba ,all this army who is paying them without good plan. nothing only cows problems since God create them as human beings but short thinking. We know each other, gura & gundat batil in 1875& 1876 .yaberashin tebasa yaye besat ayichawotim. Abay/ gion yigenebal,yegnam afemuz mar sayihon ,isat nawu yamitefawu!!! ‘ ADIWA ‘ at this time i advise Egypt/ misra ,this is not african foot boll game team. it is Ethiopia national Defence force: if Egypt enterst is attack , Ethiopia directly or indirectly to stop construction of EGRD.game is over. Ethiopia is the only country in the world never colonized by external body.Ethiopia is the strongest country in Africa. threat of Egypt over Ethiopia is nothing but propaganda. any measure taken by Egypt over Ethiopia dam ,get its value by double.